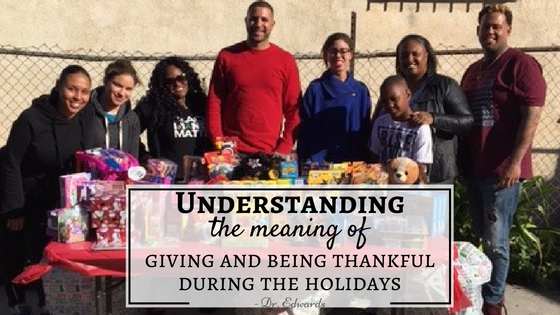 The holiday giving season is in full force and for a lot of people, the holidays are the time to give back. This could mean donating to a favorite charity or helping out at a local shelter. Some people may re-evaluate just how much to give to charitable causes and where to donate. These are, of course, highly personal decisions and depend on our financial circumstances, life experiences and/or personal connections to a particular cause. With giving comes gratitude. When you donate you appreciate what you have and you are thankful when you receive gifts. Gratitude is one of the most important elements for success. It’s the key to experiencing life at its best. The holiday season is about being thankful, relaxing at the end of the year and spending time with family. Unfortunately, for some, this season has come to mean a season of shopping and consumption, though. When we are willing to spend our money on gifts for the ones we love, we should offer some of our treasure to those most in need. Americans’ charitable behavior tends to remain relatively steady. Households gave an average of 1.9 percent of their income after taxes in 2012, according to Giving USA, an annual report conducted by the Indiana University Lilly Family School of Philanthropy (Bernard, 2013). Now we have the technology and social media to help make giving back easier, more effective and something you can do anytime, anywhere! Givin g to those who need it most is not just when you go to your house of worship or when you are thinking about end-of-year tax receipts anymore. So many sites and tools have made it easier than ever to reach more people who are interested in giving back and to find people or efforts most in need. Technology has made giving more social, mobile, local and global. Whether it is making your annual holiday gift, donating to a natural disaster relief effort or connecting to volunteer opportunities, there is an easy to use resource for you. Being conscious of the gift received is part of what it means to be thankful. Being thankful means expressing that consciousness, as well as the happiness, Genuine thankfulness requires a bit more effort, because you have to dig deeper into the true meaning. Exercising in gratitude empowers you to be thankful in all circumstances. It can open up a new level of living and offer a new outlook on life. “Becoming your best self-begins with cultivating a lifestyle of gratitude” (Sanders, 2016). When you are pausing to give thanks, whether at a church service, with family and friends over dinner or in a quiet moment, go a little deeper. Rather than making a list of the things and people you are grateful for, take a moment and think about the meaning of the relational act of being thankful. If you can, pause in the meaning and stay with it. When doing this, you might understand gratefulness in ways not experienced. Contentment will create the conditions that you desire to see in your life. Cultivating a lifestyle of gratitude will be the best decision you ever make.